The story of the Bainbridge Island blend actually begins in California. In late 2012, my store manager told me that there was going to be a “blend off” and the winner will have their custom blend launched within the district. Since I knew we would be moving in a few months, I declined to enter, but my store manager pushed me to reconsider. I decided that I would create a blend, afterall, I had worked in this district for almost 8 years, I wanted this to be my final good bye. I originally approached creating this blend with mass appeal. I wanted it to be available in both decaf and regular, which right off the bat, limits my options of what I could use. I played around a lot with Pike Place and Willow (at that time was offered in decaf as well). I created a few different blends, none of which were very good, and I was not happy with any of it. I took a few days to recollect my thoughts and intentions. The next phase in the blend development was having fun. And that’s exactly what I did. I just started putting coffees together, no rhyme or reason to what I was doing, I just wanted to be wild, and try different things, engage my partners and customers in the process. During this time, I reignited my passion for coffee and our craft. I found myself doing many coffee tastings a day, some alone, but mostly with partners. While I was pleased with my personal development, I wasn’t happy with how the blend was progressing. I decided to take a step back, to take off my mad scientist apron, and think about what I wanted to create. Northern California is most known for it’s redwood forests, and I have always found inspiration from the trees. Mike and I took a trip to Fern Canyon so I could photograph the artwork for the logo. Looking up at the huge groves of redwood trees it got me thinking about roots. 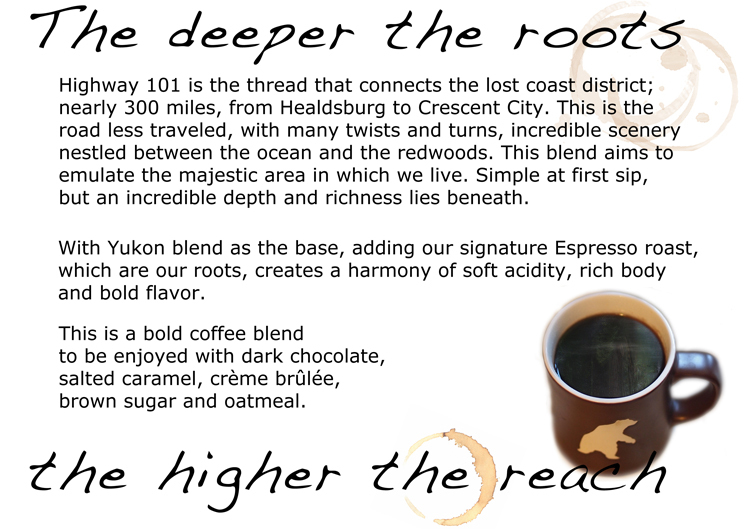 I have an old Starbucks poster hanging in my office that says “The deeper the roots, the higher the reach.” and that quote became the inspiration for what happened next. The next day at work I didn’t blend any coffee. Instead I decided the next phase should be research. I started asking customers about their at home coffee purchases. How do you brew coffee at home? I got varied answers.. french press and automatic drip were the most popular. Working in this store for such a long time, I already knew what the most popular at home coffee was. Core Sumatra. At that point I knew I wanted to use Sumatran beans as my base, but did not want to use Sumatra. I settled on Yukon, it’s dark enough to satisfy the dark roast crowd, but mellow enough to also attract the medium-light roast drinkers. The cocoa notes from the Guatemalan beans in Yukon would lend themselves nicely to whatever I decided to pair with it. Comparing blends against each other. One day, we were out of dark roast to brew, so we switched over to Espresso Roast. This would happen semi often being in a remote market, being so isolated that if the roads were closed we couldn’t get deliveries. I clearly remember this day. A customer walked in, who usually gets an americano, but exclaimed “YES!” I’ll have a grande Espresso Roast. I asked him why he was so excited, and he told me that he wishes we would brew Espresso Roast every day, it’s his favorite. Intrigued, I poured myself a short cup of Espresso Roast. It was everything I love in a brewed coffee; rich body, bold, sweet with a low acidity, and those great caramel notes. I started playing with the ratios of Yukon and Espresso Roast, balancing the flavors, creating something that is bold, yet approachable. When I found the right blend, I knew instantly I had created something special, something that I love, but in preliminary tests, customers loved it too. All of the feedback had been overwhelmingly positive. At this point both the blend and artwork were ready to submit, but I wanted to take it one step further. I wanted to create an experience for the judges. 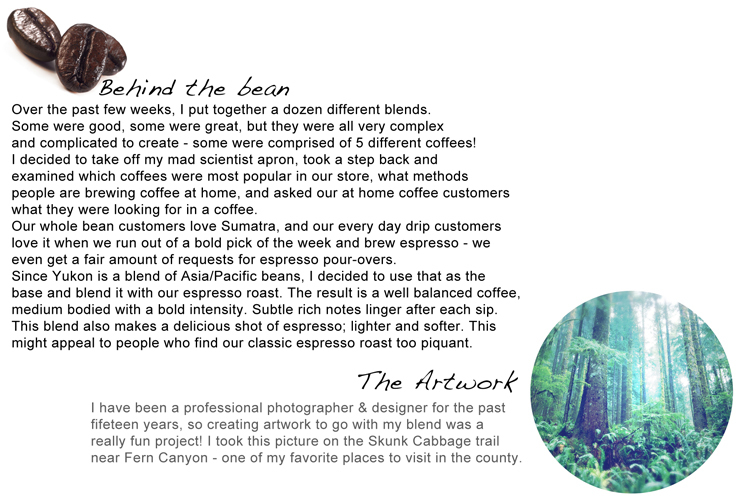 I created a “press pack”, including the story behind the bean, logo production and two custom recipes. All packaged in a wooden box that I had stained with the 101 blend and transferred and distressed the logo on to. I remember the feeling I had when it was completed, that I put together something amazing, something that shows my coffee passion and artistry. Even if I didn’t win, it felt just right. I submitted my blend in April 2013. Shortly after this, we found out that we were being stationed in Silverdale, Washington in June. The months flew by, it was June, and I hadn’t heard an update about the contest. I actually assumed that it was forgotten about. We moved to Washington, I started at my new store, and life was awesome. On July 16th I got a phone call from my old store manager. She called to tell me that I had won the contest for the blend! My artwork didn’t win, and there was a name change somewhere along the way, but my blend won! I couldn’t believe it. I was every emotion you could imagine. I was so happy, but I was also really sad because I wasn’t there to celebrate. My blend was going to be sold in every store in my district, but I wasn’t there. It somehow didn’t seem fair. All of my hard work, but I couldn’t see the results. At this point I became pretty depressed. I was in a store that didn’t have coffee passion like my old store. My partners couldn’t relate to my excitement about my blend, and I really needed an outlet for coffee engagement. I turned to Instagram. I started posting pictures of my tastings, and I quickly got the attention of Starbucks social media team. They invited me to come to the Starbucks Support Center (SSC) to do a tasting of my blend! I made my coffee-caramel dark chocolate macarons from the press pack and created a little french press portioned bags for partners to take home with them. I had so much fun telling this story to SSC partners, sharing my passion for coffee with them, and just being inside that building for the first time. It was the most amazing opportunity, one that I won’t soon forget. Over the next few months, I started receiving strange messages from my friends in California, saying they couldn’t find my blend for sale, and could I send them some. I called my old store manager and she had informed me that corporate told them they had to stop selling the blend. I didn’t get the specific reason why, but I was heartbroken. Several months go by, and I was asked to be part of a new store opening in the spring/summer of 2014 on Bainbridge Island. This was kind of a big deal since Starbucks has been trying to secure a location on the island for many years. Bainbridge Island is an island in the middle of the puget sound, and only a short 35 minute ferry ride to Seattle. This store opening was groundbreaking, and we were asked to create a special beverage to connect the community to our new store. My new store manager reached out to me, and asked for my input on creating a custom Bainbridge Island latte. I instantly knew that this was my opportunity to re-introduce my blend to Starbucks. I suggested changing the heart of the beverage, changing the espresso to our “Bainbridge Island blend”. He pitched the ideas to our leadership, who loved the idea. Everything happened so fast during this time. All of a sudden, not only was my blend approved by Starbucks, it had a logo, we had a mug, we had special bags to bag it in. It was overwhelmingly awesome. On September 4th 2014, Bainbridge Island blend made it’s debut. It is served as espresso (core for flat whites) on the clover, and is sold in half pound bags. Since the launch, my blend has inspired other partners to create their own blends. 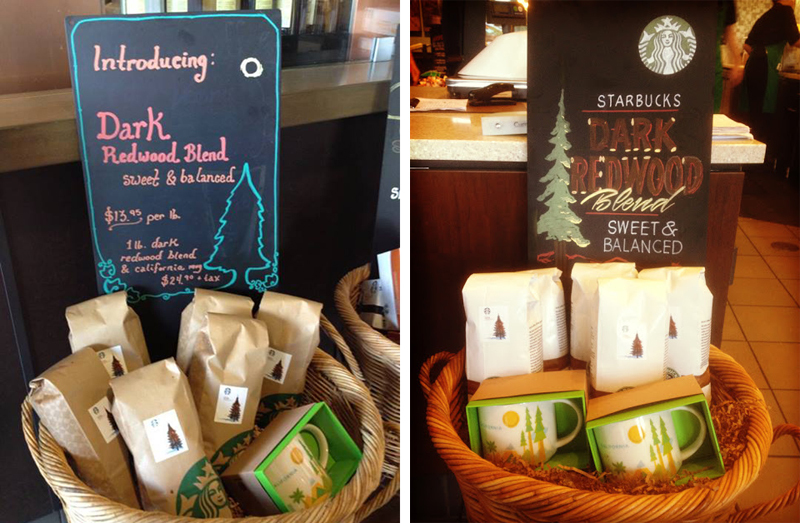 I worked with the Bozeman and Breckenridge team to help bring their custom blend to their stores! 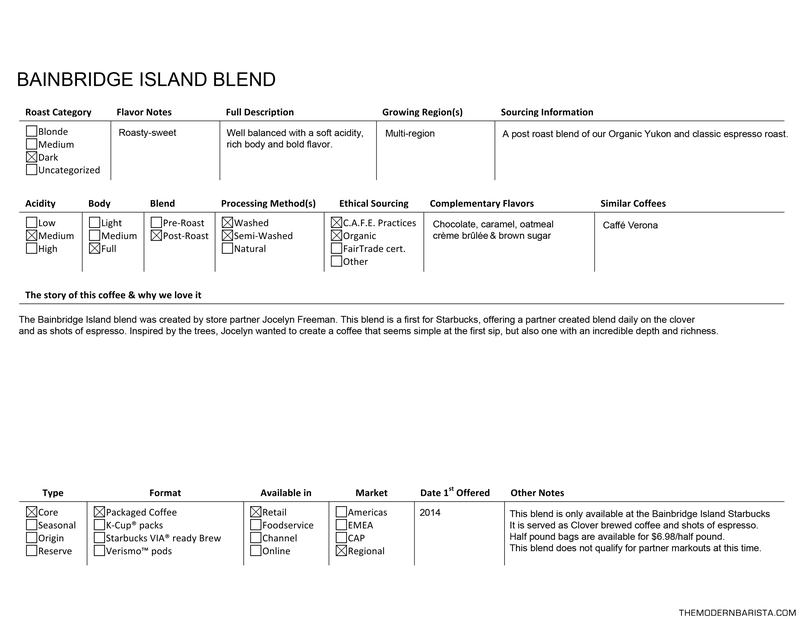 Here is the tasting sheet I created for Bainbridge Island blend.